Mildred (Milly) L. Zantow (1923-2014) became the first woman member of the Sauk Prairie Optimist Club in 1987. Milly later became the first woman Optimist Club President when she became President of the Sauk Prairie Club in 1992. In 1993, she became a life member of Optimist International and the first female Lt. Gov. (Zone 6) of SWIS District of Optimist International. 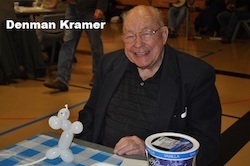 Milly was recognized as the 2005 Sauk Prairie Volunteer of the Year and she received the 2006 Hometown Hero Award with husband Forrest (Woody) Zantow. Milly received many richly deserved awards for her service to the Optimist Club and other community charitable organizations. From 1975 to 1979, Milly also was the first Volunteer Administrator of the International Crane Foundation in Baraboo and was the pioneer of the plastics recycling process that is used to this day. Her work with cranes and recycling crossed paths in 1978. During her tour of Japan to work with cranes, she saw first-hand recycling in action. This convinced Milly, in spite of her many doubters, that recycling was possible here. Upon her graduation from High School, Milly won the I-Dare-You Honor Roll Award from the Danforth Foundation. The Award came with the challenge to Dare-Greatly-Live Usefully and Share Freely all worthwhile things in Life. Milly accepted this challenge and followed her sister Edith’s advice, “Always do all the good you can, for all the people you can, in all the ways you can, just as long as you can”. 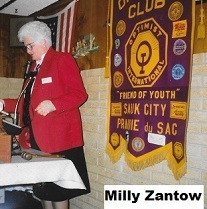 The Sauk Prairie Optimist Club acknowledges the contributions of Milly Zantow.